After getting the contact microphone I now could try and record sounds of the human body inside myself. I'm wanting to do this since my themes of the project have been the human body and trees. Experimenting with a contact microphone allows me to play around with the noises and sounds from what the initial project and subjects have been about. To get the most clear sound without much static and unwanted noises picked up I tried taping the mic to parts of my body so it could be close and flat to the sources. I tried drinking water, breathing and swallowing for the first few tests I then went on to try and do further recordings in the sound studio. I got some interesting sounds but sadly would pick up the drilling of the builders every now and again. After getting a wide collection of different body functions and sounds I then tried recording the other theme of the project trees and the forest. It was at times really difficult and tricky since tree's on their own don't really make that much sound. But what did help where the elements of nature which created very surreal and atmospheric sounds. Putting the microphone into a hollow tree let me hear the wind blowing through it as well as the amplified surroundings as it made a sort of giant speaker. Recording against tree's surfaces sometimes didn't always give me much feedback but I would sometimes pick up insects. Being a nature sound recorder can take a lot of paitance. But natures elements helped a lot as well as the general sounds of forests and I got a lot of sound clips to work with. I edited the sound in audacity to create a mixed track of overlapping human and tree recordings. I had the idea to do the audio in this way since most of the project since the photography is nearly all mixed images of the contrasting themes. 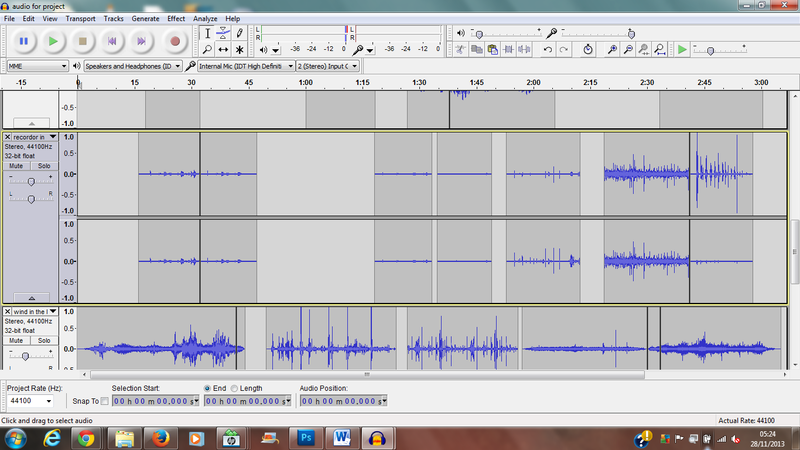 Here is some samples of the sound clips unedited. To just show some examples of the types of clips I had been recording and will be using for the final movie soundtrack. I will be adding this sound to the contrasting Photoshop images from the previous post. I will be setting up my assessment space very soon to show my work and sketchbooks. And getting all my files ready for submission just the final push now. Here is the final audio track with progress photography.